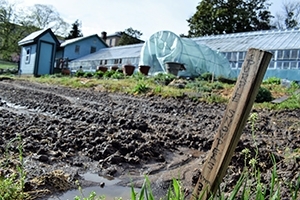 Can a local farm less than an acre in size have an impact on international food security? That’s what students in School of International Service (SIS) Professor Johanna Mendelson Forman’s food security course went to find out at the Franciscan Monastery of the Holy Land in Northeast, DC. The monastery is home to a three-quarter acre farm, a 100-year-old greenhouse, and an apiary with several beehives that help pollinate the farm’s plants. Since 2013, this urban farm has produced 13,500 pounds of vegetables for donation to local charities like DC Central Kitchen and Martha’s Table. The farm’s CEO, Lou Maroulis, CAS/BS ’79, worked in IT for 30 years before taking over the monastery’s farm two years ago. Maroulis is now back on campus auditing Mendelson Forman’s food security course because he wants to understand the context of international food security outside the monastery’s gates. Through auditing the course, Maroulis found many parallels between the fight against hunger in DC and the fight against hunger globally: “DC is like a microcosm of what’s happening on the world stage with food,” he said. Although the US government is not purposefully creating famine by stopping food from crossing state borders, as other international governments like South Sudan have done, Maroulis said that there are still very real borders dividing areas of DC where fresh food is readily available to residents and where it is not. “We have two wards in DC, on the other side of the Anacostia, that are food deserts,” said Maroulis. Food desserts are areas where nutritious food is inaccessible to and unaffordable for residents. More than three-quarters of food deserts in DC are located east of the Anacostia River in Wards 7 and 8, according to a recent study by the DC Policy Center. These wards are also home to high concentrations of poverty. Maroulis found more and more connections between local efforts to feed the DC community and international efforts to ensure food security on a larger scale as the course progressed, so he took his classmates on a tour of the farm to explore those connections. Like Maroulis, Farr also plays a role in the local effort to reduce hunger. He sits on the board of directors for Community Food Works, an organization that runs several farmers markets in DC and helps low-income people who receive federal nutrition assistance access fresh foods. Farr also cautioned that, in an international context, food donations are not a sustainable way to feed whole communities. He noted that there is a conflict between aid organizations feeding hungry people in the short term and creating ways to feed those people while supporting local farmers in the long term. “You want to have a situation where you have sustainable livelihoods for small farmers,” Farr said. “When you donate food, you put a bunch of free food into the market; farmers who would normally sell their food no longer have a market, and their livelihoods are diminished. So I think there’s always a balance” when establishing successful food security. It’s inescapable that ending hunger globally requires more complex considerations than what small farms and food donations alone can provide. However, acknowledging the widespread presence of food deserts and instituting a culture of urban farming are two small steps along the way to food security for vulnerable populations.